Somehow it worked. Writer-director Ryan Coogler (Fruitvale Station) and co-writer Aaron Covington managed to gracefully advance the 40-year saga of Rocky Balboa, tying in the previous films in the series while adding fresh touches. As a lifelong Rocky fan, I admit to initial resistance due to the fact that Sylvester Stallone was not writing the screenplay. From a purists’ standpoint, it just didn’t seem right. But seeing as he serves as the film’s co-star and one of its producers, Stallone obviously endorsed Coogler and Covington’s vision. What could’ve easily been a cheap cash-in on a past-its-prime franchise emerges as a cause for celebration. 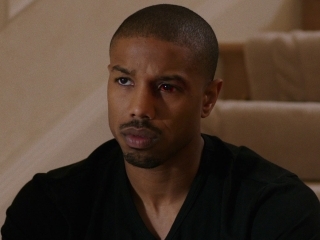 Michael B. Jordan takes top billing in Creed as Adonis, the illegitimate son of the late boxing legend Apollo Creed—virtually no one is aware of Adonis’ parentage. As Adonis embarks on a boxing career of his own, the simple story takes most of its cues from Stallone’s well-worn template, with Adonis (who actually goes by Donnie) toiling away in lucrative but uninspiring white collar job. His real passion is to follow in the footsteps of the father he never knew. He lives in virtual anonymity with his unofficial adoptive mother, Apollo’s widow Mary Anne (Phylicia Rashad, taking over for Sylvia Meals who played the character in Rocky II and III). Donnie quietly agonizes over his outsider status: the son of a sports legend and also a promising amateur boxer, he remains rootless and unrecognized. The first act is a bit clumsy, truth be told. Heavy in exposition and burdened by sometimes dull dialogue, the film gets off to a workmanlike start. But once Donnie quits his day job, journeys from L.A. to Philly, and seeks out Rocky, Creed hits its stride. The chemistry between Stallone and Jordan is key to film’s success. Falling into a father/son relationship, after Rocky’s initial resistance to have anything to do with Donnie, the two actors click right into place. Rocky’s training of Donnie results in a faster rise to a title fight than even Rocky himself was able to provide Tommy Gunn in Rocky V. There aren’t too many surprises in the overall plot mechanics, but the tone of film manages to capture the same mix of soapy drama and rousing inspiration that made Stallone’s films such winners. The fight scenes pack a visceral wallop and so do the lead performances. Michael B. Jordan straddles the line between vulnerability and confidence. As his hearing impaired musician girlfriend Bianca, Tessa Thompson (Selma) is natural and unaffected (comparisons have been drawn between Bianca and the original series’ Adrian, but make no mistake—this is a different kind of character and Thompson makes it her own). Rashad does was she can with a woefully underwritten role (how did Coogler and Covington miss the opportunity to stage an emotionally-charged confrontation between Mary Anne and Rocky all these years after the death of Apollo?). 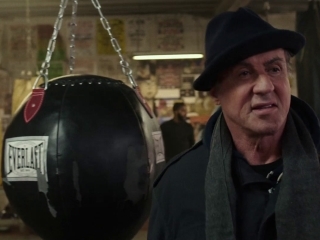 In addition to Jordan’s inspired performance, Stallone also provides Creed with its solid emotional core. This character—this creation of Stallone’s, his enduring legacy—is so deeply in the actor’s blood that he can seemingly slip into the character with apparent ease. Yet he continues to explore, develop, and deepen the role. Allowing Rocky—one of cinema’s most distinctive lead characters—to settle into a supporting role was a brave, gracious move on Stallone’s part. Director Coogler has helped guide Stallone to one of the standout performances of his career. Rocky Balboa provided an emotionally satisfying close to Rocky’s career as a boxer. 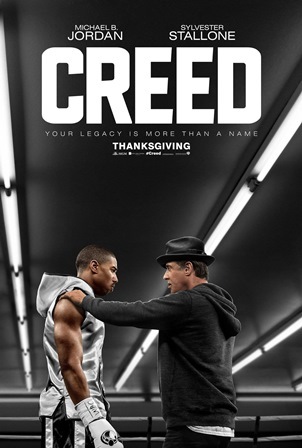 Creed offers an uplifting alternative to Rocky the boxing trainer, a quarter century after his ill-fated attempt to work with Tommy Gunn. Interestingly, Creed raises the stock of Rocky V considerably, which—in light of the events of Balboa and the new film—can now be viewed as the necessary dark chapter in Rocky’s saga and an essential turning point for the character.